Camden is preparing for another sparkling and dazzling week of Winterfest activities! The week kicks off with shimmering ice-carving in the Amphitheatre on Saturday, February 3, 2018. 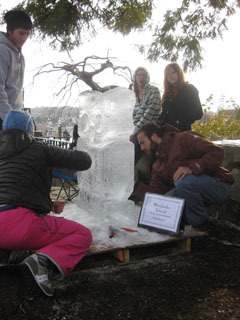 The Camden Public Library hosts the annual Community Ice Carving in the Amphitheatre on the afternoon of February 3. “It’s surprisingly easy with the right tools,” says master carver Tim Pierce. 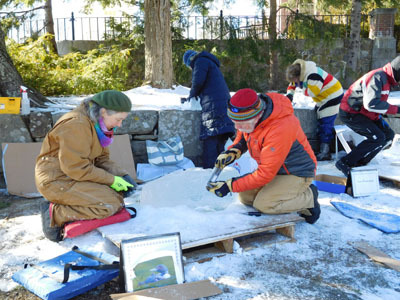 “The ice is extremely fragile but extremely strong, it’s soft to carve — but doesn’t last very long!” Pierce will give an ice-carving demonstration in advance of the Community Ice Carving; the demo will be on Sunday, January 28, at 1:00 pm, outdoors in front of the Library. Anyone interested in joining the ice carvers should fill out an application, available online and at the Camden Public Library. The cost of the application is just $60 to pay for the ice block. The specialized ice-carving picks will be available to all teams, and participants are welcome to bring their own tools, although chainsaws are not allowed. Click here to download the application. Apply soon! Your medium will be a 300-pound block of clear ice, measuring 10” x 20” x 40”. Chef Pierce will serve as a consultant for all carving designs prior to the festival, providing advice on whether your design would work in the medium of ice. Then, on Winterfest morn, he and his colleagues will rough out your pattern into your ice block in preparation for your carving during the Winterfest. There will be live music and kids crafts indoors at the library during the Community Ice Carving, and more music and hot food outdoors, as well as the ice carving in the Amphitheatre. There will also be a CamJam snowboard event and a Polar Plunge in Harbor Park on February 3, all part of the kickoff to Winterfest. The schedule will include daily events during Winterfest, starting with the Ice Carving, CamJam, and Polar Plunge. Stay tuned for more updates to the schedule. Camden Winterfest 2018 is a week-long celebration of winter with outdoor and indoor activities, beginning with ice carving and culminating with the Toboggan Nationals. From the opening celebration in the Amphitheatre to the closing victory celebration at the Toboggan Nationals, Camden Winterfest is a lively winter phenomenon for families, visitors, and teammates. 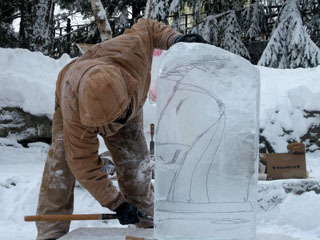 Winterfest builds on the traditions of the ice-carving Winterfest celebration begun fifteen years ago and the Toboggan Nationals that began over twenty-five years ago on the restored toboggan chute at the Snow Bowl. It promises to be a growing, dynamic, community-based festival full of mid-winter activities for all. 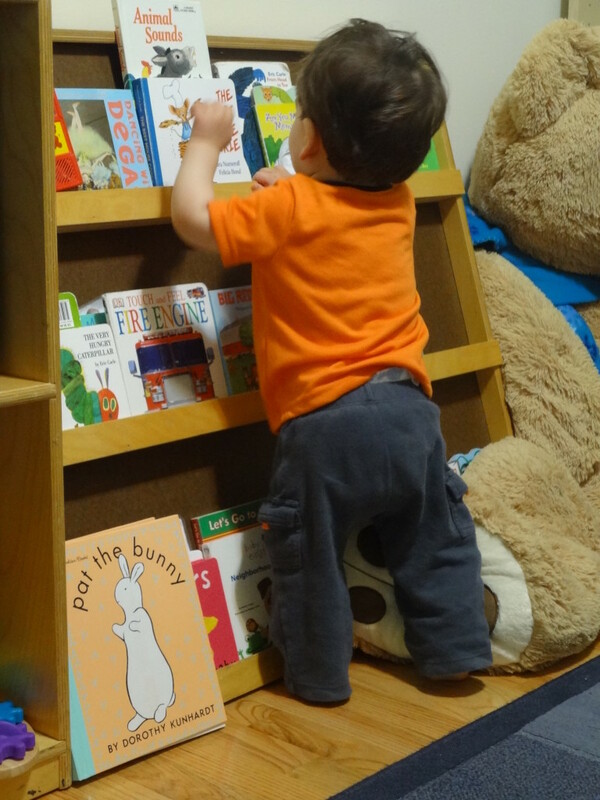 Click here for updates to the schedule.